Print up to 50,000 pages in black or 50,000 pages in colour without replacing the ink1 thanks to this printer’s super-high-yield ink supply units. 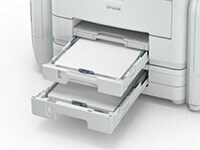 Introducing PrecisionCore, the next generation of inkjet printing technology. From professional and industrial-level printers to your desktop inkjet, this groundbreaking technology delivers fast printing with superior quality results. A truly innovative system, PrecisionCore features Epson’s advanced thin-film piezoelectric (TFP) elements, which are produced via the MEMS manufacturing process, based on semiconductor micro-fabrication techniques. At the core of this proprietary technology is the PrecisionCore MicroTFP print chip, a digital chip that prints at the micron level — 1/100th the size of a human hair. It’s this extraordinary focus on accuracy and detail that enables PrecisionCore to deliver revolutionary results, whatever the task at hand. 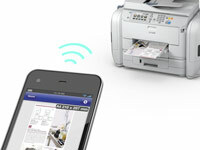 Print on the go from a smartphone or tablet using Google Cloud Print™ with your Gmail™ or Google Drive™ account. Plus, print from your Chromebook™ and Google Chrome™ without installing drivers or connecting cables. It’s now even easier to share your Google content from anywhere. 1R14X Black ink pack prints about 50,000 pages. R14X Colour Packs print about 50,000 pages on average. Actual number of pages will vary. Replacement ink pack yields are based on testing with ISO/IEC 24712 patterns with Epson’s methodology in Default mode, printing continuously. Yields may vary considerably for reasons that include images printed, print settings, temperature and humidity. Yields may be lower when printing infrequently or predominantly with one ink colour. All ink colours are used for printing and printer maintenance. For print quality, part of the ink from the included cartridges or ink packs is used for printer startup and a variable amount of ink remains in the ink pack after the “replace ink pack” signal appears.